Another Controversial Arlington County Project? The Arlington Sun Gazette's Scott McCaffrey reports this morning, according to the headline, that "Opponents could mount ballot fight against fire-station relocation." "Opponents of the controversial proposal to relocate Arlington’s Fire Station #8 may have come up with a way to stop it – using the ballot box. "At a July 30 community forum where county fire officials affirmed their desire to move the station from Lee Highway about a mile north to Old Dominion Drive, one critic reminded the audience that while funds to plan the station’s move are in the government’s hands, those for construction costs are not yet available. "Arlington officials could place funds for the $12 million project on a public-safety bond referendum that will go to voters in November 2016. If that is the case, those opposed to moving the fire station out of the Hall’s Hill neighborhood could mobilize to try and defeat the bond. "Odds would be long: Arlington voters have not turned down any county bond referendum since 1979, and most referendums pass with 75 percent or more of the vote." "The Arlington County Republican Committee in mid-July affirmed a resolution calling on the county government to carve any project valued at more than $25 million to its own individual referendum. But even if such a policy were to be adopted, it might not apply to the fire station; officials estimate construction costs for a new station at $12 million, although adding in a new headquarters for the Office of Emergency Management could push the total cost closer to the $25 million threshold." One Arlington County taxpayer who attended last night's meeting reports that at least 300 citizens attended, and filled almost the entire gym. Arlington County has set-up a webpage for "Fire Station #8 Future Location." Included are a fact sheet, maps, an ongoing list of questions and answers, meeting materials, and response time data. The third meeting is currently scheduled for September 9, 2015 at Yorktown High School. Be sure to sign-up for the e-mail alerts, though. "Another heavily-attended community meeting left most attendees still angry over both a proposal to move Fire Station #8 out of the Hall’s Hill neighborhood, and the community-engagement process surrounding the plan. "“Pitting communities against one another? That seems like an old tactic from 60 years ago,” said Marguarite Reed Gooden, among those leading opposition to the proposed station move. "Gooden was among about 150 people who descended on Langston-Brown Community Center in the heart of the historically black Hall’s Hill community July 30, as county officials again tried to explain their reasons for proposing to move the station from their neighborhood. "County officials say the process remains open and no decision has been made, but many residents are convinced that is not the case. “Is this a done deal?” asked Frank Wilson, a neighborhood resident and the longest serving School Board member in county history." GDP Growth, or the Worst Economic Recovery in 70 Years? The Department of Commerce's Bureau of Economic Analysis released the 2nd quarter 2015 gross domestic product (GDP) statistics this morning. "U.S. economic growth accelerated in the second quarter as a pick up in consumer spending offset the drag from soft business spending on equipment, suggesting a steady momentum that could bring the Federal Reserve closer to hiking interest rates this year. "Gross domestic product expanded at a 2.3 percent annual rate, the Commerce Department said on Thursday. First-quarter GDP, previously reported to have shrunk at a 0.2 percent pace, was revised up to show it rising at a 0.6 percent rate. "The revision to first-quarter growth reflected steps taken by the government to refine the seasonal adjustment for some components of GDP, which economists said left residual seasonality in the data, as well as new source data." A chart in the CNBC/Reuters report showed GDP changes for each quarter in 2013, 2014 and 2015 while the chart in the Washington Post report included the quarters for 2012. Reports from Bloomberg, Fox News, and the Washington Post were similar. "As it periodically does, the BEA revised previous years' GDP numbers, and what it found this time is that growth in almost every quarter since 2012 was weaker than it previously calculated. "The result is that GDP growth from 2012 to 2014 was just 2%, not 2.3%. In dollar terms, the revisions cut more than $100 billion from the nation's economic pie. "Even President Bush's recovery from the 2001 recession — widely derided by Democrats and the press for being far too tepid — was stronger that Obama's. After 24 quarters, Obama's GDP is up a mere 13.3%. By this point in the Bush recovery, GDP had grown 18%. "Looked at another way, if Obama's recovery had been merely average — that is, if it had kept pace with the average of the previous 10 — the nation's economy would be $2.07 trillion bigger. "One measure of America’s lowered expectations is that so many economists cheered Thursday’s second quarter growth estimate of 2.3%. It’s a rebound from the first quarter slump! The consumer is resilient, net exports are up, the plow-horse marches on! All true, but those silver linings obscure the larger reality that six long years after the recession ended in June 2009 the American economy has become a slow-growth machine. "That’s the story underscored by the annual government revisions in historical GDP that accompanied the second-quarter report. The news, which most Americans have long felt in slow-growing wages, is that the worst expansion in 70 years has been even weaker than we thought." "Obama said, "The economy, by every metric, is better than when I came into office." "That claim is too sweeping. Certain measures of wages and income, the poverty rate and the duration of unemployment are all worse now than they were when Obama "came into office." "The statement contains an element of truth but ignores facts that would give a different impression, so we rate it Mostly False." If you have a few minutes to spare, find out what your members of Congress are doing to build the base for an economic recovery that resembles the recoveries of the 1980's and 1990's than the current one. We've provided contact information for members of Congress when we growled on July 24, 2015 and in our June 16, 2015 Growls. And kudos to the editorials in both Investor's Business Daily and the Wall Street Journal. UPDATE (8/1/15): At the American Enterprise Institute (AEI) blog, James Pethokoukis writes about alternative views of the anemic U.S. economy, and points out the most recent 10-year period is the first since 1945 without a single year of 3% growth. He also links to his weekly column. "The federal prosecution of individuals charged with white collar crimes is significantly lower than it was 20 years ago, according to thousands of case-by case records analyzed by Syracuse University's Transactional Records Access Clearinghouse (TRAC). 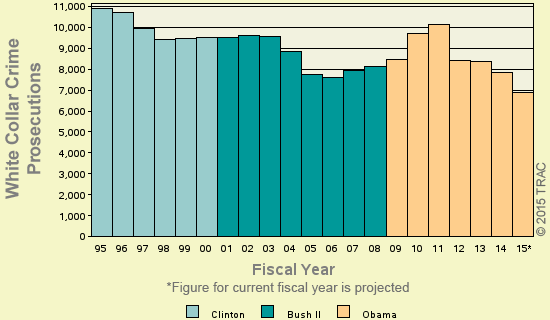 Records obtained under the Freedom of Information Act show that the overall decline began under President Clinton, and indicate that for the full 2015 fiscal year under President Obama such prosecutions will be at their lowest level since 1995. "As categorized by the Justice Department, white collar crime involves a wide range of actions such as health care fraud and the violation of tax, securities, federal procurement and other laws. The decline in such prosecutions does not necessarily indicate that white collar crime is on the wane but may reflect changing and sometimes unannounced enforcement priorities set by the executive branch and Congress. "The records indicate that during the first nine months of FY 2015, the government brought 5,173 white collar crime prosecutions. If the monthly number of these kinds of cases continues at the same pace until the end of the current fiscal year on September 30, the total will be only 6,897 such matters, about one third (36.8%) fewer than twenty years ago." "The decline in federal white collar crime prosecutions does not necessarily indicate there has been a decline in white collar crime. Rather, it may reflect shifting enforcement policies by each of the administrations and the various agencies, the changing availabilities of essential staff and congressionally mandated alterations in the laws." Perhaps more importantly than the 20-year trend chart above are Table 2 and Table 3 in the report, which provide a detailed look at the charges filed and top judicial districts, respectively. Taxpayers interested in following the work of TRAC can obtain free monthly reports in "categories such as immigration, drugs, weapons and terrorism." In addition, "TRAC's reports also monitor selected government agencies such as the IRS, FBI, ATF and DHS. For the latest information on prosecutions and convictions through June 2015," visit this TRAC webpage. The TRAC press release provides links where more detailed criminal information is available. Just curious, but could any of the decline over the past few years be the result of chasing cops and "disparate impact," as suggested by a cyber-friend? For the record, "TRAC is self-supporting and depends on foundation grants, individual contributions and subscription fees for the funding needed to obtain, analyze and publish the data we collect on the activities of the US Federal government." Kudos to TRAC for their continuing efforts to provide the public with information about criminal enforcement. You can help support TRAC here. Better yet, take a few minutes to learn what your members of Congress are doing about white collar crime. We've provided contact information for members of Congress when we growled on July 24, 2015 and in our June 16, 2015 Growls. In a column for tomorrow's Investor's Business Daily, John Merline writes, "After trending downward since 2002, national health spending jumped 5.5% in 2014 — the steepest climb in seven years — as ObamaCare's Medicaid expansion and insurance subsidies took effect, according to the latest data from the Centers for Medicare and Medicaid Services." "Spending by the federal government jumped 10.1% last year, compared with 3.5% in the private sector, the report shows. "The finding runs counter to repeated boasts by President Obama that ObamaCare had ushered in the lowest rate of health spending growth in decades. "CMS data show that between 2002 and 2009, the annual growth rate in spending dropped steadily from 9.6% to 3.8%, where it hovered until last year. Credit for the slowdown was attributed to previous Medicare reforms, the rapid growth in "health savings account" type plans, and in more recent years the recession and slow economic recovery. "The latest forecast projects that annual spending increases will average 5.8% over the next decade, which the report, published in the journal Health Affairs, attributes to "the Affordable Care Act's coverage expansions, faster economic growth, and population aging." In conclusion, Merlines says, "The report also notes that by 2024, the government will account for 47% of national health spending, up from 40% in 2007." 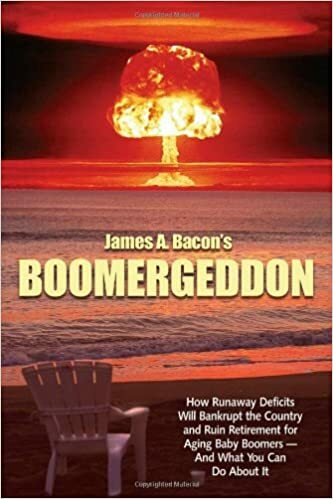 Sounds like time again to crack open my well-worn copy of James Bacon's "Boomergeddon: How Runaway Deficits and the Age Wave Will Bankrupt the Federal Government and Devastate Retirement for Baby Boomers Unless We Act Now." As Jim explains at his popular blog, Bacon's Rebellion, "Boomergeddon is the day investors stop buying U.S. Treasuries — the day the U.S. government goes into default, the global economy is thrown into turmoil, the American empire begins to crumble, and the social safety net starts to unravel. Buy the book here." Here are two book reviews of "Boomergeddon." One at Financial Post by Jonathan Chevreau. Here's a second by Rick Sincere. "The Ex-Im Bank is an independent government agency that was founded in 1934 to help encourage U.S. exports. The bank provides taxpayer-backed direct loans, guarantees, and export credit insurance, which totaled $27.5 billion in fiscal year (FY) 2014. "Not only has Rep. Fincher flip-flopped, he has repeatedly made erroneous claims in defense of the bank. In a July 15, 2015 speech on the floor of the House, Rep. Fincher claimed the bank, “supports about 200,000 jobs each year at no cost, let me repeat, no cost.” That claim is often repeated by proponents of the bank. However, a May 2014 Congressional Budget Office report found that when the fair value accounting method is used, Ex-Im Bank has an estimated 10-year cost of $2 billion. "Rep. Fincher also defended his newfound support for Ex-Im as being about employment for small businesses. “Back home in the district, it’s jobs, jobs, jobs,” Fincher said. Once again, Rep. Fincher is pushing flawed arguments. About two-thirds of the bank’s payouts went to only 10 businesses in 2013, some of which had profit margins in the hundreds of millions. Stable, profitable companies such as Boeing, Caterpillar, Chevron, Dell, and Halliburton, have all received taxpayer support from the Ex-Im Bank despite having had no trouble securing private financing. "The bank is also a haven for fraud. A July 2014 review of Ex-Im Bank Office of Inspector General data by The Heritage Foundation found that between October 2007 and March 2014, there were 792 claims of fraud resulting in 124 investigations. Since 2009, there have been 85 indictments for fraud, bribery, or other wrongdoing, with 48 criminal judgments issued. That is among the many reasons why elimination of the Ex-Im Bank was included in Prime Cuts 2015. CAGW's justification is fully documented; links provided in CAGW's announcement. By the way, Rep. Fincher isn't alone in "flip-flopping" on the Ex-Im Bank. The Washington Post reported last Friday that President Obama is also a "flip-flopper," writing, "in a speech during Obama’s first presidential run in 2008, he called the bank 'little more than a fund for corporate welfare.'" For the record, this once Tea Party conservative from Tennessee's 8th Congressional District has a score of 67% (D) from Conservative Review. The Tennessee House delegation includes three representatives with scores of 70% or higher (C and B). Contact information for Rep. Fincher is available at Congress.gov. His office phone number on Capitol Hill is (202) 225-4714. And kudos to Citizens Against Government Waste (CAGW) for their continuing efforts to ferret out waste, fraud, and abuse. How High is Virginia's Gas Tax? Do you know how much of the price you pay for a gallon of gasoline is composed of gas taxes -- federal and state? "This week’s tax map takes a look at state gasoline tax rates, using data from a recent report by the American Petroleum Institute (API). Pennsylvania has the highest rate of 51.60 cents per gallon (cpg), and is followed closely by New York (45.99 cpg), Hawaii (45.10 cpg), and California (42.35 cpg). On the other end of the spectrum, Alaska has the lowest rate at 12.25 cpg, but New Jersey (14.50 cpg) and South Carolina (16.75 cpg) aren’t far behind. These rates do not include the additional 18.40 cent federal excise tax. 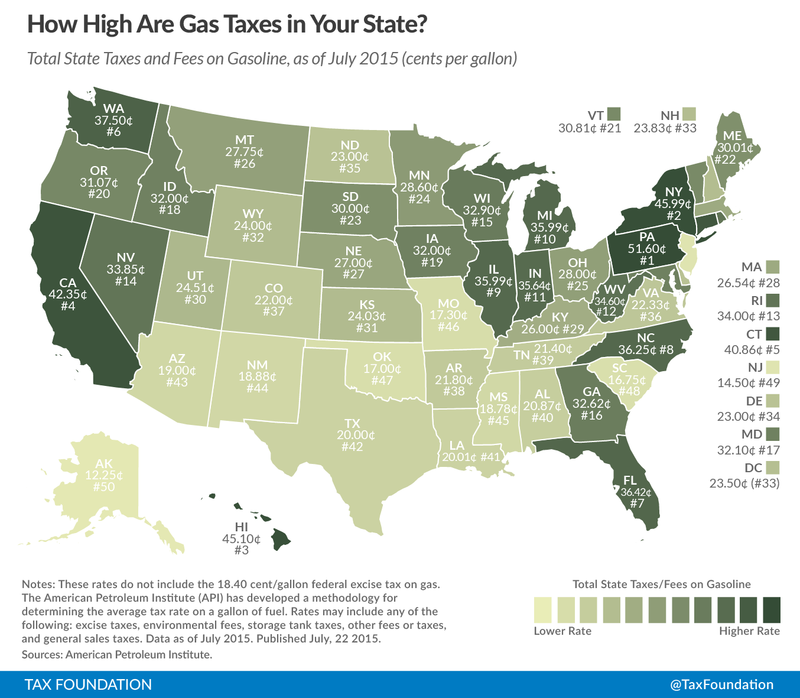 "States vary in how they impose gas taxes. Some impose a cents per gallon excise; others impose motor fuel-specific wholesale or retail sales taxes or “rack taxes” based on average prices over a given period; and many impose environmental cleanup and other miscellaneous taxes atop the traditional gas tax. API’s methodology converts these disparate tax structures into an estimate of gas taxes expressed in cents per gallon to facilitate comparisons across states." If those numbers are too small to read, Virginia's excise, or gas, tax is 19.83 cents per gallon (cpg) plus 2.50 cpg for other state taxes/fees meaning Virginians are paying 22.33 cpg in state gas taxes. Adding in the 18.4 cpg for federal gas tax means that currently somewhere around 15% of the price of a gallon of gas in Virginia goes to the Tax Man, more than double the profit margins of most oil companies. By the way, the API webpage includes information about diesel taxes and several interactive maps. Incidentally, the federal diesel tax is 24.4 cpg. So while those semi's going up and down I-95 are providing more wear and tear to the road surface, they're also paying an additional 6 cpg in taxes. Kudos to the Tax Foundation for publishing tax information that keeps taxpayers "in the know." Stephen Dinan reported in yesterday's Washington Times that "IRS risks ‘unfair’ audits of nonprofits," based upon an audit and subsequent testimony by the General Accountability Office (GAO). "The IRS’s process for picking which nonprofits it audits is so loose that it could be abused, with the potential for political targeting, the government’s chief watchdog said Thursday. "Government Accountability Office investigators said the IRS doesn’t do a good enough job tracking audit decisions, and doesn’t rotate through the officers that make those decisions, leaving open a window for mischief. "This increases the risk of unfair selection of organizations’ returns for examination,” the GAO investigators said in their report. "Combined with the 2013 finding that the IRS unfairly targeted tea party groups for special scrutiny in their tax-exempt applications, Republicans said the report suggests a real danger to nonprofit groups." "Nonprofit groups apply for tax-exempt status at the beginning of their operations, which is when the IRS targeted tea party organizations for special scrutiny, the agency’s inspector general found. But as they operate, the nonprofits are supposed to file returns showing their activities comply with the law, and that’s where the audits, which are the subject of the new report, come in. "The IRS selected 1,144 groups for an examination in fiscal year 2014, the GAO said. That’s a tiny fraction of the universe of 1.6 million tax-exempt organizations." "Staff could deviate from procedures for some selection processes without executive management approval." "(Exempt Organization) management does not consistently monitor selection decisions." "IRS examines tax-exempt organizations to enforce their compliance with the tax code. Examinations can result in assessment of taxes or revocation of tax-exempt status, among other things. "GAO was asked to review IRS’s criteria and processes for selecting exempt organizations for examination. This report (1) describes these processes and (2) assesses the adequacy of examination selection controls. GAO reviewed IRS criteria, processes, and controls for selecting organizations for examination and spoke with IRS officials; assessed whether IRS controls followed Standards for Internal Control in the Federal Government; reviewed random probability samples from two populations of examination files; and conducted tests on populations and random probability samples from three databases used in EO examination selection to determine the adequacy of EO’s control implementation (for files closed in fiscal year 2014). GAO also conducted eight focus groups on internal controls topics with EO staff who conduct research or make examination selection decisions." In addition, the subcommittee chairman's opening statement is here. "After months of denying that the IRS has been targeting tea party groups for special scrutiny, Lois Lerner, Director of the IRS's Exempt Organizations Division, admitted that the IRS had been giving additional scrutiny to applications for tax-exempt status from goups with the "Tea Party" or "patriot" in their title. She denied there was any political motivation and blamed the practice on a low-level employee in Cincinnati." There's hardly a day that goes by that there is not some news. According to Day 30, he "officially" started calling it a scandal on Day 7. Kudos to Paul Caron and the Tax Prof Blog for tracking the daily reporting of what must be the most complete history of this period in the history of Internal Revenue Service. Federal Entitlement Program "to go bust in 2016"
Reporting at the Washington Examiner on Wednesday morning, Joseph Lawler writes, "The Social Security disability program will run out of money in late 2016, a report issued Wednesday by the Social Security and Medicare trustees warned." "At that point, the 10.9 million beneficiaries of the program face an immediate 19 percent cut in benefits, unless Congress intervenes. "The combined trust fund for the retirement and disability programs is projected to run out by 2034, a slight improvement from last year's estimate. "The trust fund for Medicare hospital insurance will be depleted by 2030, unchanged from last year. "The new figures were published Wednesday as part of the annual update on the programs' finances from the Social Security and Medicare trustees. "Federal retirement programs face long-term fiscal problems largely because of demographics. Demographers expect that the number of retirees claiming Social Security benefits will rise from less than 50 million today to 71 million by the time the baby boomers are done retiring in 2029. The ranks of Medicare beneficiaries will grow from 56 million to 80 million. "The more immediate deadline, however, relates to the disability program, which provides income security for disabled workers, widows and widowers, and children." "The Social Security Disability Insurance (DI) program is running short of money. Under current projections, its trust fund will be exhausted by the end of 2016, causing an automatic benefit reduction of about 20 percent if no legislative action is taken—a significant financial shock for those on the disability rolls. "To prevent these benefit cuts, some have proposed supplementing DI from the larger Social Security retirement trust fund. A new study published by the Mercatus Center at George Mason University argues, however, that policymakers should use this opportunity to adopt much-needed reforms of the Disability Insurance program. DI reform should (1) take account of the current retirement program and (2) not inhibit future retirement program reforms. This strategy has the potential to return DI to its original purpose—providing income support for those who cannot work due to permanent disability—while also putting the program on a path of fiscal sustainability." "The annual check-up for Social Security is in, and one program looks more dire than the rest." Note the picture accompanying the Post story of activists in front of the White House urging the expansion of Social Security. More delusion on the part of progressive liberals on the Left! Newsmax, where their lede said, "Social Security’s Disability Insurance trust fund will run out of reserves next year without congressional action, trustees said, urging U.S. lawmakers to address the nation’s unsustainable entitlement programs." The Washington Times reported yesterday, "To stave off the cut, Rep. Xavier Becerra, California Democrat, proposed merging the two trust funds, using retirement money to cover the disability fund shortfall in the near term." Sheesh! Just what's needed -- a short-term fix. Do members of Congress ever fix anything? The Social Security Disability Insurance (DI) trust fund is on the brink of depletion, and is projected to be exhausted in late 2016 – just over a year from today. Absent legislation, beneficiaries in that program would face an immediate 19 percent across-the-board benefit cut. On a combined basis, or assuming reallocation or interfund borrowing, the Old Age, Survivors, and Disability Insurance (OASDI) trust funds are projected to be exhausted in 2034. At that point, all beneficiaries would face an immediate 21 percent across-the-board benefit cut, which would grow to more than 27 percent by 2090. Over 75 years, Social Security’s actuarial imbalance totals 2.68 percent of taxable payroll, or about 0.96 percent of GDP. The gap between Social Security spending and revenues is projected to grow from 1.3 percent of payroll (0.46 percent of GDP) this year to 3.5 percent of payroll (1.26 percent of GDP) by 2040 and 4.7 percent of payroll (1.62 percent of GDP) by 2090. Overall, this year’s report represents an improvement over last year’s, which showed a combined trust fund exhaustion date of 2033 (one year sooner) and a 75-year actuarial imbalance of 2.88 percent of payroll (0.20 percentage points higher). "Although the projections have slightly improved, Social Security’s long-term outlook is fundamentally unchanged. The SSDI trust fund will be depleted next year, and the combined trust funds by the time today’s 48-year-olds reach the normal retirement age – or when today’s newest retirees turn 81. "Policymakers must act quickly to put Social Security on a path toward solvency. As time goes on, it will be more difficult to secure the Social Security programs for current and future generations with thoughtful changes instead of abrupt benefit cuts or tax increases." "Many, if not most, people who are zealous advocates of minimum wage laws, for example, never check to see if these laws do more good by raising some workers' wages than harm by preventing many young and inexperienced workers from finding jobs. "One of my own pieces of good fortune, when I left home at age 17, was that the unemployment rate for black 17-year-old males was in single digits that year -- for the last time. The minimum wage law was ten years old, and the wage specified in that law was now so low that it was irrelevant, after years of inflation. It was the same as if there were no minimum wage law. "Liberals, of course, wanted the minimum wage raised, to keep up with inflation. The result was that, ten years later, the unemployment rate for black 17-year-old males was 27.5 percent -- and it has never been less than 20 percent in all the years since then. "As the minimum wage kept getting raised, so did the unemployment rate for black 17-year-old males. In 1971 it was 33.4 percent -- and it has never been under 30 percent since then. It has often been over 40 percent and, occasionally, over 50 percent. Source: His July 23, 2015 column, posted at Townhall.com. "After an exchange testy even by recent County Board standards, board members voted 4-1 on July 21 to move forward with hiring an independent auditor who will report to them rather than the county manager. "The move had been expected ever since the General Assembly earlier this year gave board members the power to create and fill the position. "“We’re always working to get better – this is a step in the right direction,” said board member Libby Garvey, who supported the action. "While the result of the July 21 vote was preordained, getting to it involved heavy sparring between independent John Vihstadt, who supports hiring an auditor, and Democrat Walter Tejada, who has vigorously opposed it. "Tejada complained that hiring an independent auditor was designed to sow a “culture of distrust of government,” pointing a finger at Republicans, and said Arlington had been in good hands having county staff and outside auditors keeping track of the books. "Vihstadt, who has ties to the Republican Party but was elected as an independent, shot back, noting dryly that the measure was patroned by a Democrat (Del. Patrick Hope), signed into law by a Democrat (Gov. McAuliffe), supported by every Democrat in the Arlington delegation and passed unanimously by the General Assembly. "The proposal to create the new position has gotten under Tejada’s skin; he has waged a verbal battle against it for months. But he was playing defense: The County Board majority in support of it never wavered, and the proposal had the support of the Arlington County Civic Federation and Arlington Chamber of Commerce." "Tim Wise, president of the Arlington County Taxpayers Association – a group that has pressed for years for an independent auditor – said the county government’s action did not go far enough. “If a ‘world-class community’ engenders $1 million bus stops, $1.2 million playgrounds and $1.5 million dog parks, then it seems the currently planned spending of $200,000 for internal auditing is insufficient,” Wise said." As McCaffrey reported, we've growled frequently about the need for Arlington County to establish a professional, independent audit function. That would include proper staffing, which would require performing a risk analysis. A year ago -- in our May 10, 2014 Growls -- we asked who was looking out for the interests of Arlington County taxpayers, and pointed out that based upon staffing of Virginia state agencies and a "back-of-the-napkin" analysis, we estimated the need for a staff of 10 auditors. Patricia Sullivan of the Washington Post also reported on the Board's "bickering" in a story posted Tuesday evening. Surprise, Congress Favors Spending Over Saving. It's True! 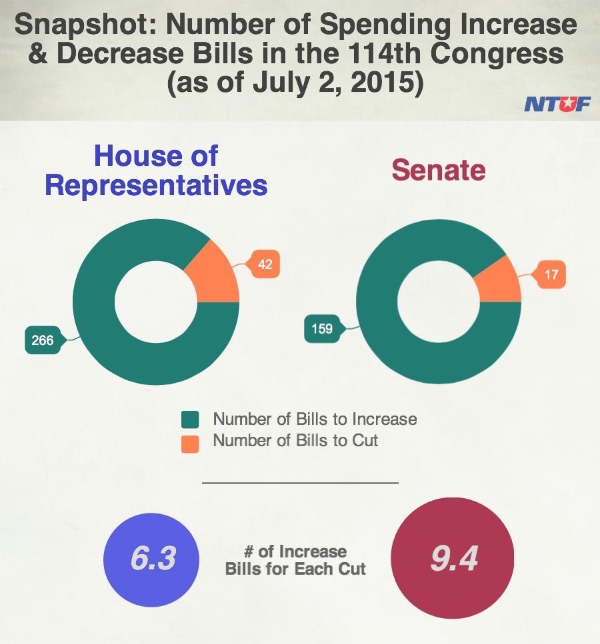 The newest issue of the National Taxpayers Union Foundation's "Taxpayers Tab" provides a snapshot of the first six months (through July 2, 2015) of the 114th Congress, noting that "Congress favors spending over saving." "Since 2008, ten different U.S. municipalities were forced to declare bankruptcy. One of the leading causes of these fiscal crises was inability to cover pension costs for public employees. Many states are also trying to figure out how to finance their unfunded pension obligations. Just this week, Puerto Rico managed to make a last minute payment on its bond debt and thus avoided default, but analysts are very concerned that the U.S. territory will be unable to meet future payments or cover its payroll costs. "The U.S. government is not immune to such problems. On June 19 the Director of the Congressional Budget Office warned Congress, “The long-term outlook for the federal budget has worsened dramatically over the past several years.” Without major reforms going forward, deficits and debt will rise to unsustainable levels. "On March 13, the level of publicly issued debt reached $18.1 trillion, just $25 million shy of the statutory limit. The amount has been frozen at that level for the past 15 weeks as the Department of the Treasury has implemented “extraordinary measures” in order to continue to finance its obligations. But as expenditures from the Treasury continue to exceed revenues into it, these measures will only last for so long. "While it remains to be seen how this looming impasse will be resolved, there are measures in Congress that would reduce spending. Unfortunately, they are outnumbered by bills that would increase outlays." The average annual cost of legislation scored in the Senate so far is $412 million per year. In the House, the average is about $603 million per year. There have been far more savings bills scored in the House than in the Senate. In the House, there were 6.3 increase bills scored for every savings measure; in the Senate, there were 10.1 increases for every decrease. Of the 17 savings bills scored in the Senate, 7 would cut spending by $1 billion or more per year. Meanwhile, 19 of the 42 savings scored in the House would cut the same amount. The two most expensive bills in the House, H.R. 1000 and H.R. 2332, would increase federal spending by a total of $297.5 billion per year. That is more than twice the annual cost of all the increase bills scored in the Senate combined ($133 billion). Ask for a written response, and tell them ACTA sent you. And kudos to the National Taxpayers Union Foundation for continuing to shine a light on the spending habits of members of Congress. "When is an improving fiscal situation not really an improving fiscal situation? When it’s the United States’ current one. "That’s the lesson of the White House’s annual budget update, known as the Mid-Session Review, which was published Tuesday by the Office of Management and Budget (OMB). Data in the report show the federal government is on course to record a $455 billion budget deficit this year, which is $128 billion less than the Obama administration had projected six months ago. Expressed as a percentage of gross domestic product, this is even more impressive: it amounts to six-tenths of a percent of GDP that we were planning to borrow this year, but won’t have to borrow after all. Well over half of this unexpected deficit reduction is due to above-forecast tax revenue, generated by the economy’s continued growth. Given the report’s forecasts for next year, it is likely that, as a share of the economy, the budget deficit at the end of the Obama presidency will be three-quarters smaller than it was at the beginning. Not too shabby. Source: Washington Post editorial, posted July 18, 2015. "Americans did not become wealthy by redistributing income. They became wealthy by innovating, learning, and working hard. Most of the immigrants that came were unskilled. So, too, were the workers who came from the farms to industry. They began at the bottom, learned by doing on-the-job training, and earned higher wages. This model seems to be breaking down in our current economic climate. "Politicians can promise to narrow the income gap. They can pass legislation that redistributes more. But they cannot permanently reduce the spread between the top and the rest unless they adopt policies that encourage growth, innovation, learning, and productivity. There is no other way." Source: Essay, entitled "The Follies of Income Redistribution," July 17, 2015, in Hoover's "Defining Ideas" series. On July 8, 2015, we growled about Virginia's fiscal condition, according to a study by George Mason University's Mercatus Center. According to the study, Virginia ranked #21, "just ahead of Colorado, Washington and Kansas, and just behind New Hampshire and Texas." "The Old Dominion is an old favorite of business, with friendly regulations. 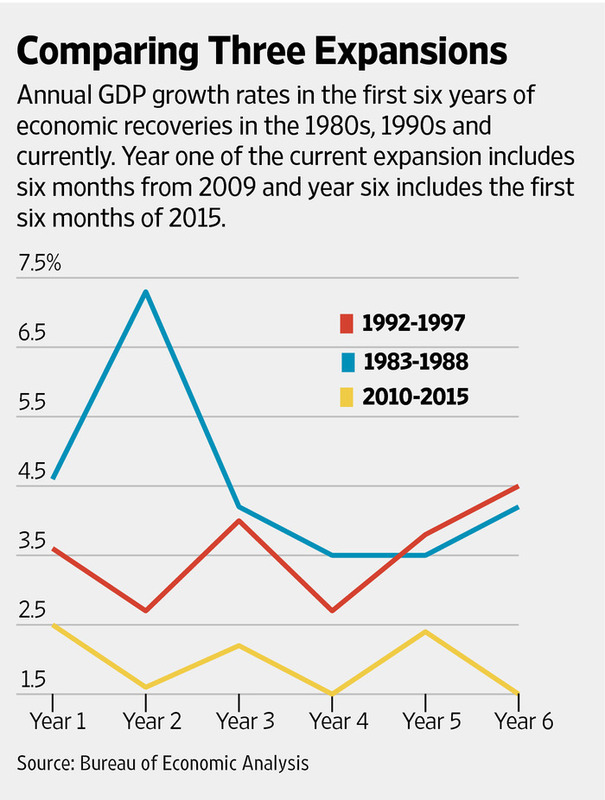 But job creation has slowed in recent years." "It’s a consistent and concerning fall from grace that, experts say, has a lot to do with the commonwealth’s longtime reliance on the federal government for job creation and its discouraging business tax structure. The cost of doing business, infrastructure, cost of living and overall economy all dragged Virginia down in the rankings. “We need to figure out what it is that’s standing in our way of growing the economy,” said Michael Thompson, president of the Thomas Jefferson Institute for Public Policy. "Fifteen years ago, Thompson said, experts were pushing for Virginia to rely less on the federal government for job creation. But nothing has really changed since, Thompson said. Sequestration is now forcing the commonwealth to come to grips with the reality that so much of its booming business has relied on the public sector. “We are creating jobs, we’re just not creating the private-sector, non-defense jobs as fast as we are losing federal jobs,” said Barry DuVal, president of the Virginia Chamber of Commerce." "The one area where Virginia is succeeding, DuVal pointed out, is having a business-friendly climate, as the rankings noted. "But perhaps the most important thing the commonwealth can do to improve its stance, DuVal and Thompson say, is to overhaul its tax structure. "While some states — such as neighboring North Carolina — are lowering the taxes of doing business, Virginia has kept the status quo. "Last year, the Tax Foundation gave the commonwealth a very middling ranking — 27th — for its business tax climate, largely due to relatively high individual income tax rates and unemployment tax rates. Compare that to North Carolina’s ranking of 16." As we wrote on June 30, we encourage readers of Growls to learn what their favorite Delegate and Senator in the General Assembly are doing to improve the fiscal ranking and business climate of Virginia. Legislators representing Arlington County in the Virginia General Assembly include: Senators (Adam Ebbin, Barbara Favola, or Janet Howell) and Delegates (Rip Sullivan, Patrick Hope, Alfonso Lopez, or Rob Krupicka). Contact information for members of the General Assembly can be found here -- use one of the "quick links" to locate the senator and delegate who represent you. The Arlington Sun Gazette reported this morning that "Arlington County government’s new hotline for waste, fraud and abuse has been running for more than six week, but is not being swamped by county workers." "Since its debut in late May through June 16, the hotline received four reports from the government workforce, county spokesman Mary Curtius said. "The new hotline, run by an independent contractor and offering anonymity, if desired, to government workers, is part of an effort by the county government to improve transparency and accountability. It was among the improvements proposed by John Vihstadt during his two successful runs for County Board in 2014. "The hotline, which accepts feedback either by phone or online, is not available to the public at large, but county officials have said they will consider implementing a reporting system for the public." Thanks to the county for setting up the hotline, and kudos to John Vihstadt for proposing this tool of accountable government. Now, let's get this really going by setting up a hotline where the public can report waste, fraud, and abuse. In a front-page story in today's Washington Times, Tom Howell reported on a new report from the General Accountability Office (GAO, which found a "potential for fraud in ObamaCare subsidies." "Fake Obamacare enrollees were able to sign up for subsidized plans and to renew them for a second year, the government’s top watchdog reported Wednesday, exposing embarrassing holes and potential fraud in President Obama’s signature health care law. "The Government Accountability Office said 11 out of 12 fictitious applications it filed as a test were approved for plans on HealthCare.gov last year and were to have been paid a total of $30,000 in taxpayer handouts. All 11 were able to re-enroll automatically in their plans for this year, too, meaning the administration didn’t weed them out in the second full year of the health care exchange operation." "HealthCare.gov is a federal insurance portal that serves 37 states without their own health care exchanges. As of June, the administration counted 10.2 million paying customers in the Obamacare marketplace. About 8.7 million received tax credits, and 6.4 million of them used the federal portal. "The subsidies are paid directly to insurers to cover costs, and taxpayers are required to square up the details in their tax filings." "PPACA provides for the establishment of health-insurance exchanges, or marketplaces, where consumers can compare and select private health-insurance plans. The act also expands the availability of subsidized health-care coverage. The Congressional Budget Office estimates the cost of subsidies and related spending under the act at $28 billion for fiscal year 2015. PPACA requires verification of applicant information to determine eligibility for enrollment or subsidies. "GAO was asked to examine controls for application and enrollment for coverage through the federal Marketplace. This testimony describes (1) the results of GAO's undercover testing of the Marketplace's eligibility and enrollment controls, including opportunities for potential enrollment fraud, for the act's first open-enrollment period; and (2) additional undercover testing in which GAO sought in-person application assistance. "This statement is based on GAO undercover testing of the Marketplace application, enrollment, and eligibility-verification controls using 18 fictitious identities. GAO submitted or attempted to submit applications through the Marketplace in several states by telephone, online, and in-person. Details of the target areas are not disclosed, to protect GAO's undercover identities. GAO's tests were intended to identify potential control issues and inform possible further work. The results, while illustrative, cannot be generalized to the full population of applicants or enrollees. GAO provided details to CMS for comment, and made technical changes as appropriate." Source: page 127, "As Certain as Death: Quotations About Taxes," 2010, compiled by Jeffrey L. Yablon, TaxAnalysts.com. The online Arlington Sun Gazette reported this morning the Arlington County Board is set to move forward in the selection of an independent County Auditor who will report directly to the Board. "Arlington County Board members on July 21 are slated to direct acting County Manager Mark Schwartz to move forward with recruitment and hiring of an independent county auditor, who will work with county staff but ultimately will be responsible to directly to board members. "The General Assembly earlier this year gave County Board members the authority to employ an auditor. Previously, the board was only allowed to hire the county manager, county attorney and clerk to the board. "Board members have allocated $200,000 for costs associated with starting up the office and hiring the auditor, with the hope that savings identified by the new staff member could offset future costs. "Under direction expected to be approved July 21, Schwartz will be tasked with starting the recruitment process within 30 days. While county officials will do the initial screening of candidates, all County Board members will be able to review applications and participate in interviews, if they desire. The final selection will rest with the board." "The new independent County Auditor function will be created in parallel fashion alongside the existing Internal Audit function within the Department of Management and Finance (DMF) in a dual office approach that reflects complementary functions in both core financial audits and program / operational audits." The charge goes on to say the County Auditor will be overseen by an Audit Committee with the current internal audit function in the Department of Management and Finance (DM&F) continuing continue with its existing staff of 1.5 FTE, The two audit functions are expected to "collaborate and cooperate." The Audit Committee will include two Board members, the County Manager or Deputy, and the DM&F director. We have growled loud and often, as has the Arlington County Civic Federation, about the need to set up a professional and fully-staffed internal audit function, most recently here. Search for additional Growls by using "internal audit" at our search facility. Obviously, we are pleased the County Board has finally started the process of filling the County Auditor position albeit slow as molasses the process has been. However, in the view of your humble scribe, there are at least three things wrong with the current plan. The first is the bifurcation of the internal audit function between the County Auditor and DM&F. It's neither efficient or economical, and will prove to be ineffective. Second, with '1.0 FTE here and 1.5 FTE there,' even if supplemented with consulting staff, the functions are understaffed. It's hard to be the proverbial "junkyard dog" when you're only bringing 2.5 FTE to the fight. In a previous Growls, we did a 'back of the envelope' estimate of the need for about 10 FTE, a number that would include the Schools' internal auditor, when compared to the internal audit organizations of Virginia state agencies. And third, the Audit Committee should include one or two citizen members, preferably someone with a professional audit background, so there is transparency with county taxpayers. At CNS News today, Terry Jeffrey reports the federal government has collected a record $2.45 trillion through June of the current FY 2015, primarily from the individual income tax -- or $16.451 per worker. Nevertheless, the federal government is running a deficit of $313 billion. "That equaled approximately $16,451 for every person in the country who had either a full-time or part-time job in June. "It is also up about $178,156,270,000 in constant 2015 dollars from the $2,268,763,730,000 in revenue (in inflation-adjusted 2015 dollars) that the Treasury raked in during the first nine months of fiscal 2014. "Despite the record tax revenues of $2,446,920,000,000 in the first nine months of this fiscal year, the government spent $2,760,301,000,000 during those nine months, and, thus, ran up a deficit of $313,381,000,000 during the period. "According to the Bureau of Labor Statistics, total seasonally adjusted employment in the United States in June (including both full and part-time workers) was 148,739,000. That means that the federal tax haul so far this fiscal year has equaled $16,451 for every person in the United States with a job." The 36-page Monthly Treasury Statement through June 2015 can be found here. The Treasury Department's Bureau of the Fiscal Services' webpage, where you can find previous issues of the MTS, is available here. If you do not know what your Members of Congress are doing to bring the national debt under control, we urge you to find out. You can contact your Member by using the information we provided in yesterday's Growls, immediately below. When writing to a Member of Congress, tell them ACTA sent you. Is U.S. Debt Really Headed to 103% of GDP, from 74%? Keith Hall, director of the Congressional Budget Office (CBO) testified before the Senate's Committee on Homeland Security and Governmental Affairs last week. His 14-page testimony, "Understanding the Long-term Budget Outlook" can be found here. A video of the hearing and member statements are available at this committee webpage. "To simply contain the debt at the high historical level where it currently sits—74 percent of GDP--would require either significant increases in federal tax revenue or decreases in non-interest federal spending (or a combination of the two). 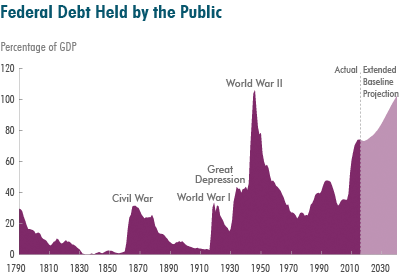 "Historically, U.S. government debt held by the public, measured as a percentage of GDP, hit its peak in 1945 and 1946, when it was 104 percent and 106 percent of GDP respectively. "In 2015, the CBO estimates that the U.S. government debt held by the public will be 74 percent of GDP. That is higher than the 69-percent-of-GDP debt the U.S. government had in 1943—the second year after Pearl Harbor. “Mainly because of the aging of the population and rising health care costs, the extended baseline projections show revenues that fall well short of spending over the long term, producing a substantial imbalance in the federal budget,” Hall said in his written testimony. “As a result, budget deficits are projected to rise steadily and, by 2040, to raise federal debt held by the public to a percentage of GDP seen at only one previous time in U.S. history—the final year of World War II and the following year,” he said. "Eventually, the nation would face a crisis—with wary investors demanding “much higher interest” rates to buy U.S. government debt. “How long the nation could sustain such growth in federal debt is impossible to predict with any confidence,’ testified Hall. “At some point, investors would begin to doubt the government’s willingness or ability to meet its debt obligations, requiring it to pay much higher interest costs in order to continue borrowing money. “Such a fiscal crisis would present policymakers with extremely difficult choices and would probably have a substantial negative impact on the country,” he said." "To keep the federal debt-to-GDP ratio at its current level, Congress would have to increase revenues by 6% or cut spending by 5.5% from levels under current laws in each of the next 15 years, the report said. In 2016, that would translate into about a $210 billion reduction in the deficit. "Federal spending on Social Security, Medicare, Medicaid, the Children’s Health Insurance Program and ObamaCare's insurance subsidies is expected to skyrocket by 2040 to a level more than twice the average over the last 50 years, the CBO warned. Two related Growls include September 24, 2010 which we titled "Lurching Towards Doom," and December 21, 2010, which we titled "On the Rood to Boomergeddon." "Raising taxes encourages taxpayers to shift, hide, and underreport income . . . . Higher taxes reduce the incentives to work, produce, invest and save, thereby dampening overall economic activity and job creation." Source: page 17, "As Certain as Death: Quotations About Taxes," 2010, compiled by Jeffrey L. Yablon, TaxAnalysts.com. A chart in the Heritage Foundation's Federal Budget in Pictures series explicitly addresses the "coming barrage of tax hikes under ObamaCare. "Obamacare imposes numerous tax hikes, which total nearly $800 billion over 10 years. Obamacare's higher tax rates on income and investment will slow economic growth, leaving hard-working Americans and businesses worse off." What is the State of Virginia's Fiscal Condition? The Tax Foundation's Jared Walczak asks, at it's Tax Policy blog yesterday, if taxpayers know whether their state's fiscal affairs are in order, acknowledging, "It’s not an easy question to answer, in part because the question can mean so many different things." "Based on the fiscal year 2013 Comprehensive Annual Financial Reports of the 50 states, this study ranks states’ fiscal solvency using 14 metrics that assess whether the states can meet their short-term bills and long-term obligations. State finances are analyzed according to five dimensions of solvency: cash, budget, long-run, service-level, and trust fund. These five dimensions are combined to produce an overall ranking of state fiscal solvency." "High deficits and debt obligations in the forms of unfunded pensions and health care benefits continue to drive each state into fiscal peril. Each holds tens, if not hundreds, of billions of dollars in unfunded liabilities—constituting a significant risk to taxpayers in both the short and the long term." "With new spending commitments for Medicaid and growing long-term obligations for pensions and health care benefits, states must be ever vigilant to consider both the short- and long-term consequences of policy decisions. Understanding how each state is performing in regard to a vari­ety of fiscal indicators can help state policymakers as they make these decisions. "A closer analysis of the individual metrics behind the ranking shows how each state’s fiscal condi­tion should be assessed. Notably, nearly all states have unfunded pension liabilities that are large relative to state personal income, indicating that all states need to take a closer look at their unfunded pensions, which represent a significant portion of each state’s economy. Another finan­cial crisis could mean serious trouble for many states that are otherwise fiscally stable." "The whole publication is worth reading, as Norcross does an excellent job of breaking down different components of state fiscal health and putting data behind each indicator. Those chiefly interested in topline findings may wish to check out the executive summary and the maps illustrating key findings. "These measures matter. As Norcross writes, “Even states that appear to be fiscally robust—perhaps owing to large amounts of cash on hand or revenue streams from natural resources—must take stock of their long-term fiscal health before making future public policy decisions." Kudos to Jared Walczak for bringing this study to our attention. And more importantly, kudos to Eileen Norcross for her research of the fiscal conditions of the states. Readers of Growls are encouraged to ask their favorite Delegate and Senator in the General Assembly to learn what those legislators did to improve the fiscal ranking of Virginia in Mercatus' annual rankings. These are the legislators representing Arlington County in the Virginia General Assembly: Senators (Adam Ebbin, Barbara Favola, or Janet Howell) and Delegates (Rip Sullivan, Patrick Hope, Alfonso Lopez, or Rob Krupicka). Contact information for members of the General Assembly can be found here -- use one of the "quick links" to locate the senator and delegate who represent you. "Virginia has a reputation for good fiscal management that it has, for the most part, earned — though part of what makes the commonwealth look so good is that other states often look so bad. Cross-state comparisons might offer imperfect guides, but they can be useful. And a recent one by the Mercatus Center at George Mason University should give state leaders pause." Ali Meyer of the Washington Free Beacon reported today that one in five Americans now participate in a government assistance program. Actually, the rate is 21.3%. “Approximately 52.2 million (or 21.3 percent) people in the U.S. participated in major means-tested government assistance programs each month in 2012,” according to the Census Bureau’s report. "Means-tested programs include Medicaid, the Supplemental Nutrition Assistance Program (SNAP), otherwise known as food stamps, Supplemental Security Income (SSI), Temporary Assistance for Needy Families (TANF), and General Assistance (GA). 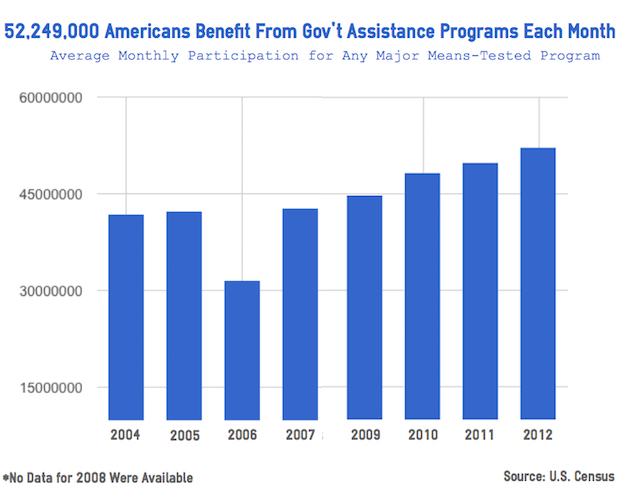 "The number of beneficiaries of these means-tested programs has increased significantly over the last decade. According to the Census, in 2004 there were nearly 42 million monthly recipients of these programs. Between that year and 2012, monthly participation increased by 24.9 percent." If the nation's politically elite are doing anything to get the economy moving, it would be hard to tell. And it's not as if we haven't growled about the economy and the need for economic growth. See here and here. Progressive Income Tax. Tool of the Welfare State? At the Investor's Business Daily website this evening, Terry Jones provides a short history of the progressive income tax, reminding us the nation "thrived" during the nation's first 124 years when there was no income tax. The progressive income tax will be 102 years old on October 3, 2015. "According to the Jan. 5-8 poll, 63% of Americans this year are dissatisfied with the amount Americans pay in taxes. In a follow-up question, most of this group -- equivalent to 46% of all Americans -- say they would like to see Americans pay less in taxes. Hardly any -- 4% -- would prefer they pay more. An additional 13% are dissatisfied with what Americans pay in taxes, but aren't specific about how it should change. "The 46% who currently want taxes decreased is notably higher than what Gallup has found since 2012. It is only exceeded by the 51% recorded in mid-January 2003, a week after President George W. Bush proposed extending certain 2001 tax cuts and implementing new ones, measures that ultimately became known as the 2003 Bush tax cuts. Gallup did not ask this satisfaction question about taxes from 2009-2011." "While only 5% of Democrats believe Americans' taxes should be increased, the largest segment, 47%, is satisfied with what Americans pay, while about a third, 31%, think they should pay less. In contrast, the largest segment of independents (46%) and a robust majority of Republicans (61%) are dissatisfied and believe taxes should be decreased." He provides a brief history of the progressive or graduated income tax, pointing out that "Article I, Section 2 of the Constitution later forbade an income tax per se and required only a uniform tax to be applied "among the several states" based on their populations." He also includes Chief Justice's 1819 admonition, "'The power to tax, . . . involves the power to destroy." "Several decades later, an obscure German political philosopher named Karl Marx showed he understood what Marshall meant. In 1848, he made a progressive tax on income one of his 10 essentials for fomenting communist revolution. It would later became a key part of the socialist and progressive movements in the U.S."
"In retrospect, however, 1913 can be seen as the year the camel first poked its nose under the tent. In just four years, the top income-tax rate soared above 70%, and rules, exceptions, exemptions and loopholes began to multiply. "'The worst thing,' economist Dan Mitchell said on the occasion of the income tax's 100th birthday in 2013, 'is that the income tax enabled the modern welfare state.' And indeed, the tax became a gusher of revenue, taking money from the private sector and directing it at a relentlessly growing federal government." "Today's system, most experts agree, is cumbersome, inefficient and unfair in the way it treats people differently. The income tax itself, with its 77,000 pages of myriad rules, rates and exclusions, is a confusing mess. Its progressiveness, moreover, discriminates against hard work and entrepreneurialism. "It also serves another function: as a handy bludgeon against political foes, and a source of taxpayer-funded largesse for political friends." Your humble scribe is rereading parts of William Voegeli's book, "Never Enough: America's Limitless Welfare State." Voegeli uses numerous charts to document the welfare state's relentless growth. Without the 16th Amendment and its accompanying progressive income tax, it is doubtful that even progressives, aka liberals, could conceive of a sufficient number of government programs to soak-up more revenue than was provided through a top rate of 7%. Kudos to Terry Jones and Investor's Business Daily for publishing the Viewpoint about the progressive income tax. And it you think you are paying too much in federal income taxes, scroll down, or visit our June 27, 2015 Growls, and write to any or all of your members of Congress. "Virginia does a haphazard job of monitoring federal tax dollars it passes along to local groups, and the state auditor’s office says that needs to change." "Each year, about $2.5 billion federal tax dollars travel through Virginia state coffers and into the hands of local governments, nonprofit organizations and even some for-profit organizations. "That amounts to somewhere around $300 for every man, woman and child in the commonwealth, but it’s hard to say where all of it’s going, or if it’s being used properly. It’s the middleman — the state agencies — that are responsible for tracking the audits of those dollars, and some aren’t doing their job, according to a new audit from Virginia’s Auditor of Public Accounts. "Of the 16 middleman state agencies studied, three haven’t kept any tabs on the final recipients of federal tax dollars. Only three checked the federal award amounts against audited statements. "Comprehensive Services for At-Risk Youth and Families, the Virginia Department of Veterans Services, and Virginia Information Technologies Agency all failed to track federal dollars they handed off, the audit finds. State auditors didn’t study where the dollars went, so it’s impossible to tell whether they were used properly." Watson also reported the responses of state agencies to the VAPA audit as well as another VAPA audit, which "pointed out the General Assembly has done nothing in 15 years to hold accountable the hundreds of local government-created “supervisory” entities that control hundreds of millions of taxpayer dollars." Read the remainder of her report here. Growls readers are urged to communicate their concerns with members of the Arlington delegation. Contact information for members of the General Assembly can be found here -- use one of the "quick links" to locate the senator and delegate who represent your district. And tell them ACTA sent you! Kudos to the Franklin Center for Government & Public Integrity for its support of Watchdog.org. The Franklin Center is a non-profit organization that promotes a well-informed electorate and a more transparent government.